Earlier this year fire destroyed three Warrandyte properties and almost swept through the township. While we realise how invaluable our brave firies and emergency services are, there’s a lot going on behind the scenes. The Diary’s MICHELLE PINI caught up with key players including chief fire commissioner Craig Lapsley. FROM three different vantage points, the Warrandyte fire in early February was an exercise in putting extensive planning to practice. At 12.18pm, Warrandyte CFA captain Adrian Mullens led the first crew on the scene. Having received simultaneous calls from “reliable sources” including an off-duty CFA officer and a former team captain, Mullens’ crew was able to arrive before official word was received from regional headquarters. Only three minutes later, after making an assessment on the ground, Mullens sent a message to headquarters: “Make tankers 10.” The quick, simple message asking for more appliances hit home. 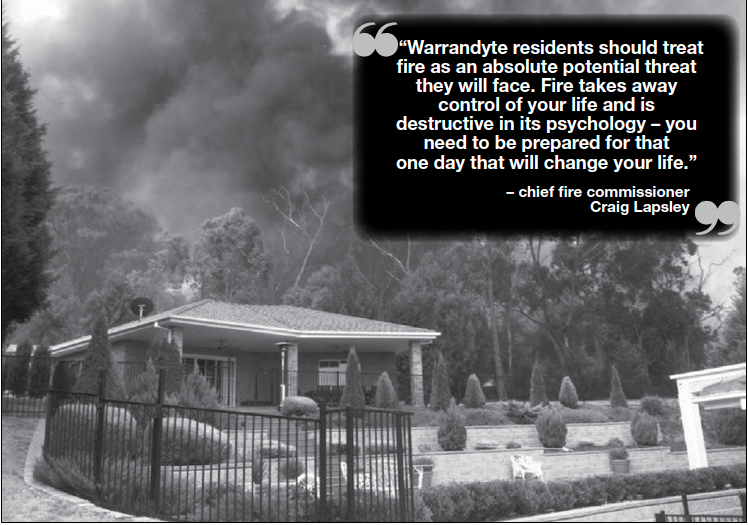 All the way from Flannery Court to the chief fire commissioner, those three words laden with meaning, conveyed what everyone had feared: a complex fire in extreme conditions had struck at the urban interface – in Warrandyte. Soon-to-be incident controller of the Warrandyte fire, regional director Chris Hardman, was at the Kangaroo Ground monitoring point already managing the Mickleham Road fire to which some Warrandyte crews and appliances had been sent. Others had also been directed to the Gladysdale fire. “We saw the (Warrandyte) fire come up on screen and while the local brigades were fighting, we were monitoring activity and preparing ourselves for the worst case scenario,” Mr Hardman said. “We knew any fire would hit hard and fast.” He explained that when CFA captains transfer control to the incident control centre due to escalating fire activity, nothing changes on the ground except the line of reporting. The centre coordinates the combined emergency service crews as well as the preparation of mapping and fire-spread predictions with several available resources and a full warnings and advice team. They are also responsible for releasing information to the public, drafting community warnings, advice and media releases. Chief fire commissioner Craig Lapsley was already at the State Control Centre in East Melbourne where representatives from all relevant agencies were meeting to discuss strategy and prioritise resources on a day when 958 fires burned across the state in a 24-hour period. Mr Lapsley described his main job on the day as coordinating the fire responses of the combined emergency services and “ensuring operational ability is effectively utilised on days of highest fire risk”. Mr Lapsley has also recently been appointed as Victoria’s first emergency management coordinator (effective from July 1), extending his area of responsibility to include any emergency. Although the fire danger index did not warrant a Code Red classification, that day had been preceded by multiple total fire ban days and the anticipated fire conditions were the worst since Black Saturday. As is normal procedure during the extreme fire season (on every day throughout that period), all applicable agencies came together at the control centre to plan and prepare, including the combined emergency services but also representatives from Vic Roads, local councils and education and tourism bodies. Mr Lapsley explained: “Although it was not Code Red, we knew it was going to be a big day. We are resource rich but the challenge is to make the most effective use of resources. Our job is about prioritising and providing a strong line of control without being bureaucratic – it’s about making and enabling quick decisions. An air-crane, for instance – a relative of ‘Elvis’ which is no longer in operation – remained in Melbourne in anticipation of fire activity in the metropolitan interface. As a consequence of that emergency planning, over 70 appliances, including major aircraft, were utilised in the Flannery Court incident within an hour and a half. Aware of Warrandyte’s vulnerability due to the extreme conditions, Member for Warrandyte Ryan Smith was also at the State Control Centre. “The response Warrandyte received on the day despite over 950 fires burning across the state, demonstrates its priority and prominence on the radar,” Mr Smith told the Diary. Inquiries into early reports indicating an electrical fault as the possible cause of the Flannery Court fire have not yet been completed. The commissioner’s department is coordinating investigations into the cause of the Warrandyte fire, along with 16 reviews pertaining to other incidents across the state, and it is envisaged the results will be released sometime this month. Mr Lapsley confirmed that the findings of the royal commission were still being implemented within the allocated tenyear time frame. The first stage of works pertaining to “cut-outs” of power lines has been completed. The commissioner said underground power was not viable in all circumstances due to topographical issues, therefore all fire-risk areas were being mapped with a range of suppression methods being considered including devices which cut power before lines touch the ground. The commissioner commended the emergency services of the Greater Warrandyte area, saying they work closely together despite being in different fire region classifications and separated by a river. He also praised Warrandyte’s community driven approach and the many passionate people involved in education and planning. Mr Hardman praised the reaction of fire crews: “The first attack mounted by the CFA crew was extraordinary. In an inaccessible area, the efforts of fire fighters on the ground resulted in a fantastic save,” he said. Mr Hardman also stressed the importance of planning and education and praised the efforts of WCA and the Be Ready Warrandyte campaign. “We need to repeat it and keep repeating it – knowledge is power,” he said. Although all three men agree that people are more aware than they were before Black Saturday, they each stressed education and awareness for the future.